In windows 8.1, SkyDrive is built in. By default it’s set to Not sync files for offline usage, just put a placeholder. 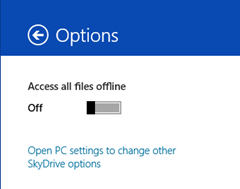 But you can set SkyDrive to sync all files or just selectly sync folders/files you want for offline usage. To make SkyDrive sync all files for offline usage, open the metro SkyDrive application from start screenshot, change Access all files offline from default Off to On. To make SkyDrive selectly sync the folders/files you want for offline usage, in metro SkyDrive app, by marking the folders/files and choose “make offline” or in desktop mode, by right clicking and selecting then appropriate option.